Lets agree that the “Mainstream media” is going to die. There are plenty of diagnoses that indicate its going to die and the only real disagreement is in terms of how much time it has left before it passes. It’s time to prepare for the hard task that comes next. It’s time to pull the plug on the traditional concept of news gathering. It’s heart may still beat as long as it stays hooked up to the advertising money machine, but the brain no longer functions. That’s a very scary thought for anyone still working at these organizations because a) We got into this career because we are journalists, not to make money and b) Money is necessary. But publications do not define our identity as journalists, and for the men and women who will soon be seeking employment elsewhere, it’s important they be reminded of that. Keep in mind, I’m not talking about freelancing to pay the bills and provide for families. The chances are great that freelance work won’t be an option for most people and they’ll have to get a job that’s extremely different than the one inside a newsroom. What I’m eluding to is for people to fulfill that sense of duty, that led them to the newsroom in the first place . If you take the financial aspect out of the equation, everything makes more sense. I’m not arguing that we abandon ever getting paid for our services to the community, but there will be times where we’ve got to be selfless and continue reporting for the greater good. 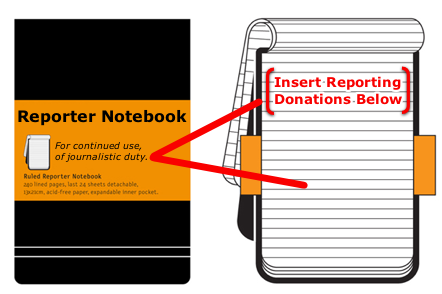 And just as members of a congregation pay a tithe to keep the church up and running, such is true of journalism too. Our congregation is everyone around us. Our church is democracy, justice and honest communication. My fellow journalists, are you prepared for anything? You are currently browsing the archives for the Death of Print category.